It’s simple, yes, but don’t be fooled. The restaurant may not have a Michelin star and there isn’t even a fancy spa, but this retreat east of Bali is everything a perfectly-formed island escape should be. 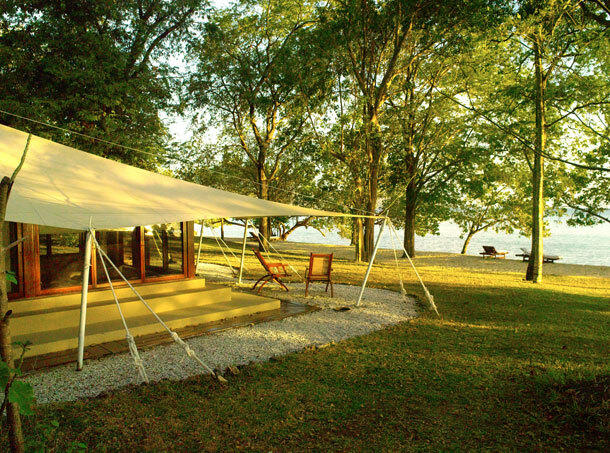 Twenty tents furnished in hardwoods, canvas, coconut and coral are pitched next to a beach lapped by the best water in the world to explore, above and below, and then swim back to shore to shower under a cliff (twist a rock to turn the water on, Flintstones-style). There isn’t a lot to do except make friends with the fishes, which is the beauty of the place. Napoleon wrasse, schools of batfish and reef sharks cruise above gorgonian fans and giant sponges, cuttle fish wobble about the sea bed as camouflaged as a chameleon. Even the house reef, named Turtle Street, is worth travelling halfway around the world for. Here, you can snorkel with manta rays and there’s a resident three-flippered turtle (who doesn’t go around in circles). Look closely to find a black-and-white damselfish living under a half coconut bobbing on the shore. And if that’s the kind of castaway life you’re seeking, the camp’s 32-metre cruiser Amanikan can make trips to the remote reefs of Raja Ampat.